What does art inclusion really mean? A two day event of discussing, reflecting and engaging in arts practice. 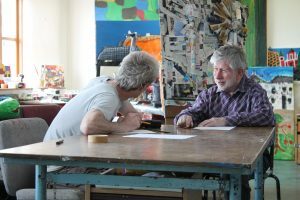 The KCAT Studio Engagement Project is a collaborative project that began in 2013 between KCAT Studio Artists and other professional artists around Ireland. In partnership with Bealtaine a series of residencies were established to create space for developing a creative relationship. As the project has unfolded, relationships between the artists have sprouted and developed. The Symposium brings together these relationships to share in their experiences and reflect upon the project. We also wish to explore the current position of arts and inclusion in an Irish visual arts context. Further contributors are: Sinead Dowling; Carlow Arts Officer, Mary Butler; Kilkenny Arts Officer, Ann Davoren; Director West Cork Arts Centre, Tara Byrne; Age and Opportunity, Helen O’Donoghue; Curator IMMA, artists: Nevan Lahart, Andrew Pike and others. The Symposium will generate content for a publication which will act as a key resource on Arts Participation in 2019. This book will accompany “Together now” a national touring exhibition of the Engagement Project in 2019-2020.